Chicken Marengo. I’d heard the name for years, but never realized that it’s a historical dish. Napoleon Bonaparte’s chef Dunand first whipped it up after Napoleon’s victory at the Battle of Marengo in northern Italy in 1800. Using miscellaneous foraged ingredients, Dunand employed considerable skill in crafting the original recipe using chicken, eggs, tomatoes, onions, garlic, and crayfish, plus a couple of glugs of cognac from Napoleon’s flask. The result was a chicken-tomato-onion stew served with fried eggs, crayfish, and soldiers’ bread rations on the side. Although this sounds like it would only taste good if you were camping, Napoleon considered the combination lucky. He insisted that Dunand prepare it the same way time and again when they returned home, despite the chef’s desire to modify the ingredients. Fortunately modern chefs are no longer literally under the sword, and have reinvented the recipe minus the eggs and crayfish and plus a few classic ingredients from Italian cuisine. My motivation in creating this recipe was to (1) remain somewhat true to its Franco-Italian roots, (2) make a recipe similar to my popular Chicken Cacciatore, yet distinct from it, and (3) as usual, work with the seasonal ingredients supplied by our CSA and my garden. That meant substituting leeks for onions--a lot of leeks, since we had 3 bunches. 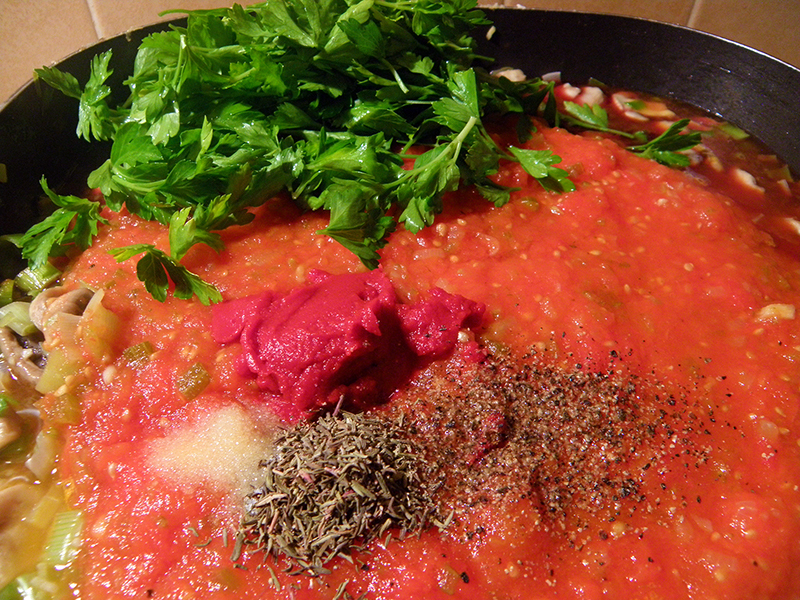 And using the last of the red garden tomatoes, which I’d stewed. I also added shallots, a staple at our Farmers’ Markets right now, and popular in French cooking. You could substitute any kind of onion for all or part of the leeks and shallots, and reduce their quantity if you prefer. I’ve written the recipe so that you can substitute canned diced tomatoes for DIY stewed: either one large (28 oz.) plus one small (14.5 oz) can, or three small cans. If the canned tomatoes are salty, you might want to reduce the amount of additional salt. Mushrooms seem to be a standard modern addition, so I went with that. Another modern tradition is to flour the chicken before browning it. Since I’ve never actually done that before I tried it. 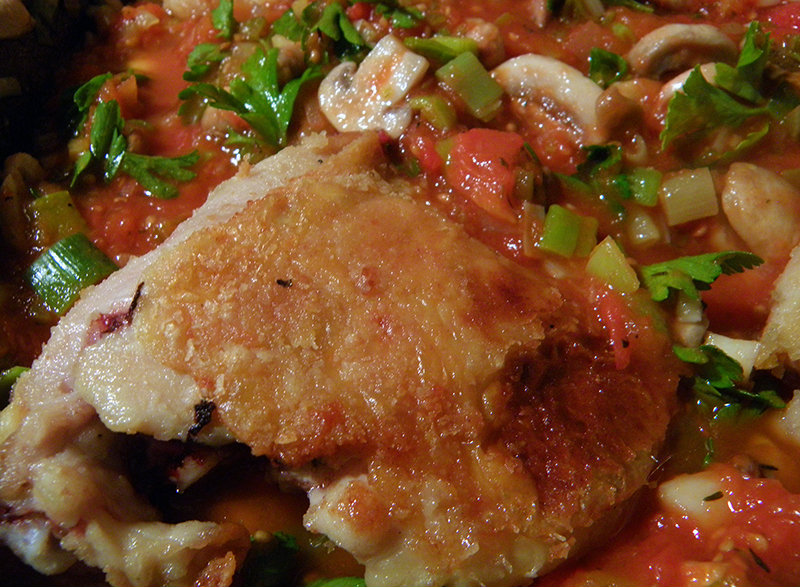 It does make the dish distinct from my Chicken Cacciatore, but might eliminate that step (and the added carb/fat crunchy stuff) next time. Some chefs like to add bell pepper: red, green, and/or yellow. 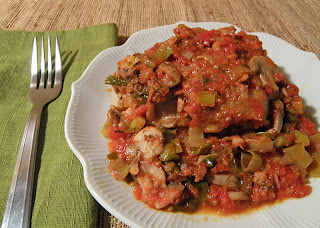 I skipped it because of including peppers in Chicken Cacciatore, but feel free to include it if you have some on hand. You could choose any traditional Italian herbs. I went with (French) thyme for tradition, and parsley (cultivated in northern Italy) because I had it on hand. Northern Italy is also well known for white wine, but either red or white can be used. You can improve the quality of this dish by using free range organic chicken. Not only are humanely raised chickens happier and healthier animals, they’re healthier and dare I say tastier for consumers. This recipe tastes better the second day, like many tomato-based dishes including Chicken Cacciatore. If you’re serving it at a dinner party, try making a night or two before then warming it up in a 350 degree F oven before guests arrive. 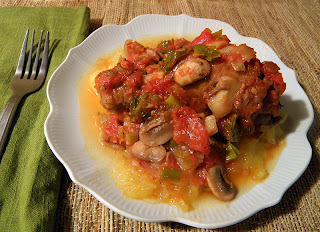 The new tradition is to serve Chicken Marengo with potatoes, which sounds excellent. Some chefs prefer the old tradition of serving it with crusty bread. We had spaghetti squash on hand, so that’s what I used. You could also use any sort of pasta, or even (decidedly nontraditional) rice. Have fun with this by using whatever herbs and veggies you like in a tomato stew. Please share a comment if you come up with a variation that you like. 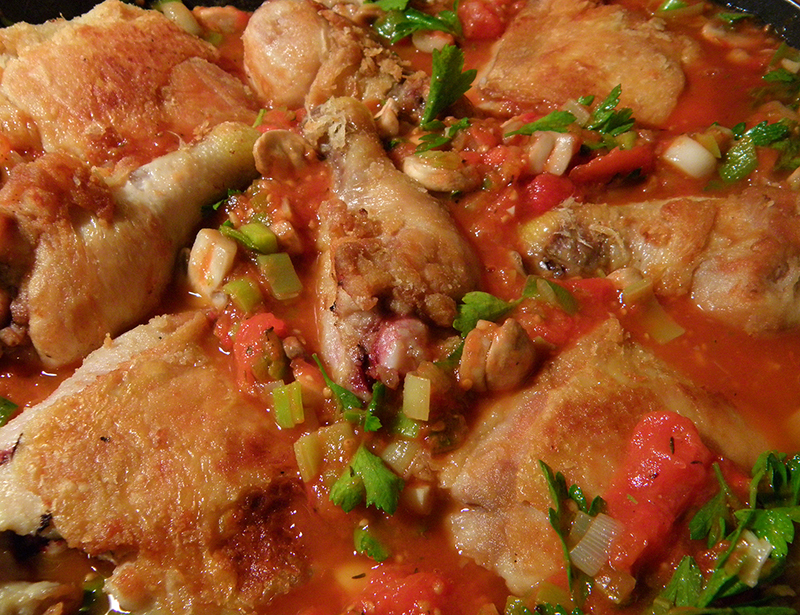 Separate chicken thighs from drumsticks. Remove any excess fat. Combine the flour with ½ teaspoon of salt and ¼ teaspoon pepper in a large ziplock bag. Add chicken pieces to bag, 2 at a time, zip up bag, and shake until chicken is coated with flour. Shake off excess flour and put chicken pieces in a single layer on a plate. Heat an electric frying pan to 400 degrees F., or heat a large skillet over medium high. When hot, add 1½ tbsp. olive oil and fry chicken parts until light brown, about 10 - 15 minutes, turning frequently. You might want to use a grease screen to cut down on splatters. While chicken is cooking, remove roots from leeks and slice lengthwise from top to bottom. Wash thoroughly. Slice only white and light green parts into ~3/8 inch half moons, discarding tough green parts. You will have 2 - 3 cups. Peel and chop shallots finely. Slice mushrooms thinly (< ¼ inch). Peel and mince garlic. When chicken is brown, remove from frying pan and drain on towel. Blot oil from top of chicken. Drain excess oil from frying pan, but leave browned bits in pan. Add 1 tbsp. olive oil to pan and return to medium high heat (375 - 400 degrees F.) Add shallots and mushrooms and sauté for about 4 minutes, stirring frequently. Add leeks and garlic and continue sautéing and stirring for another 4 minutes. Stir in stewed tomatoes, wine, tomato paste, thyme, oregano, salt, pepper, and parsley until all ingredients are blended. Bring to boil and simmer together 5 minutes. Add browned chicken to frying pan, nestling pieces down into the sauce. Spoon sauce over the top of the chicken pieces. Bring sauce back to boil. Cover pan and turn heat down to low (about 275 degrees F.). Simmer for 45 minutes. Serve over potatoes, pasta, rice, or spaghetti squash, or serve with crusty wholegrain bread.